How long does it take you to get to work? Would you trade a longer trip for a little more space at home? Zillow and HERE partnered to look at 34 cities across the U.S. and found the real-estate cost of your commute. When I ask people about their commutes, the topic frequently turns to how they take back the time. My colleague Amanda, who commutes 2 hours each way, knocks out a book a week. Erica listens to podcasts. Alexander gets a jump on work. Meghan is learning Spanish, Chris sleeps… the list goes on. But, here’s the common thread: everyone is grafting value out of the time they spend in transit. In most of the above cases, the commute time is converted into intellectual value. But, a recent study conducted by Zillow and HERE clearly demonstrates that there’s economic value as well. We interviewed Aaron Terrazas, Economic Research Director at Zillow, to understand more. Can you tell us about how this study came to life? “Generally, our economic research group is interested in any kind of data that can inform consumers and professionals about the real estate market,” Mr. Terrazas said. “We have an enormous amount of data on physical homes. But, a big part of where people choose to live is where they work, and how they get between their home and their work. 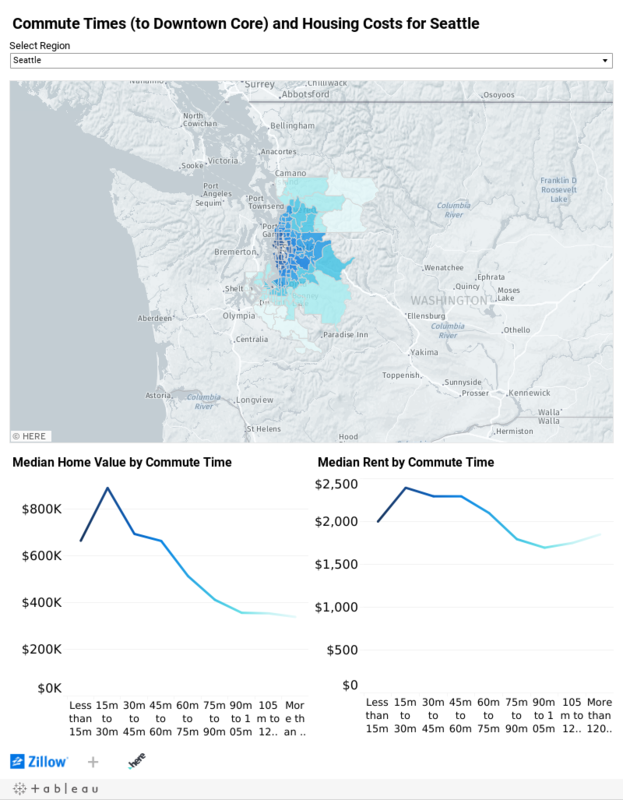 For a long time, we have wanted to do more research about commutes … how much time you save by being closer to your job versus how much you give up by typically having a smaller unit from being closer to urban employment centers. One of the key elements that enabled the study is the HERE Isoline routing capability. In brief, from any one place, an isoline can accurately depict a time-based route away from that place in any direction, along almost any means of transit. In other words, you can render a map of how far you’ll get in 20 minutes in any direction on the road. “I think the attractive feature of the HERE data was we didn't have to estimate the distance,” Mr. Terrazas continued. “There are different ways that researchers typically estimate distance between two points, like drawing a straight line or defining radii. HERE actually has the network grid. How long did someone travel over what kinds of roads, so you know what traffic is like at different points of the day. That adds a layer of reality to this analysis that a lot of other analyses lack." In compiling this data across 34 cities, what were the findings? In the study, the numbers for Boston show that the typical home becomes 13% less expensive ($57,000) if you move 15 minutes further out. “So for someone looking to buy a home - what is their trade-off between that 15 minutes extra on their daily commute. Obviously that adds up each way, 30 minutes a day, 5 days a week, 50 weeks a year. What is that versus the extra $57,000 you’re going to spend on a home to save that time? Beyond consumer information, how can this data be used for good? “Infrastructure - it’s so important. “At the research group … our mission is to help educate consumers who are in that process of, or considering buying a home. In the last 5 years, we’ve seen younger consumers delaying all sorts of decisions, like buying a house. In that, we did see a trend toward dense urban living. We would like to thank Mr. Terrazas for his time and his insight. In the meantime, happy commuting! How easy is it to walk around your city?